Sheer size isn't the only thing that makes Tyler Myers stand above the competition. When you stand 6'8” and weigh in at over 220 pounds, people take notice. But for Myers, currently in his rookie National Hockey League campaign, it's his big-time talent that has turned heads in 2009-10. Bruce Hamilton, president and general manager of the Western Hockey League's Kelowna Rockets, always knew Myers would make an impression at hockey's highest level, even if it wasn't always smooth skating for the towering defenceman. While Hamilton and the rest of the Rockets brass were content in being patient with Myers, the blueliner wasn't quite so forgiving of his errors. And, as Kelowna and the rest of the WHL found out, Myers is also a highly-skilled player. Myers began his junior career in 2005–06. Following his NHL draft year in 2007–08, he was ranked fourth among North American draft-eligible skaters by the Central Scouting Services. 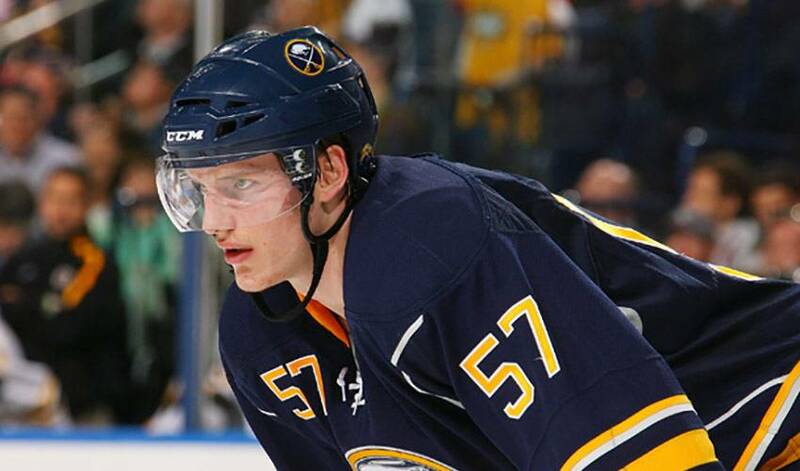 Selected 12th overall by Buffalo in the 2008 NHL Entry Draft, after the Sabres traded the Los Angeles Kings a third-round pick to move up from the 13th spot, Myers helped the Rockets to a 2009 Ed Chynoweth Cup championship following a junior career-high 42-point regular season. Scoring 20 points during the Rockets playoff run, Myers was instrumental in the franchise winning their third WHL title and was selected as the WHL Playoff MVP. Overall, Tyler is a laid-back player, making calm decisions and viewing the ice very well. That is not to say that he is shy when it comes to showing a physical side to his game. Less than 100 games into his NHL career, Myers has shown the same game-changing abilities he did in junior. He recorded his first NHL point on October 8, 2009, an assist, against the Phoenix Coyotes. On October 16, Myers scored his first NHL goal against the New York Islanders. It was his first multi-point game, when he also had an assist. On October 24, 2009, Myers was called on in the sixth round of a shootout against the Tampa Bay Lightning and scored the game winner. After an impressive first nine games with the Sabres, the Eastern Conference club decided to keep him in Buffalo rather than return him to the Rockets. It was anything but a surprise to Hamilton. A kid who hasn't forgotten the team that helped launch his big-league career. That was evident when Myers came back to Kelowna during the 2010 Winter Olympic break. For now, the focus remains on his budding professional career, one that appears to be on the fast track. “What else can you say other than that he is a special guy,” offered Hamilton. His first NHL campaign suggests Tyler Myers happens to be a special player, too.